Commentary: While I did pre-order this figure, I don't own a console on which to play Battlefront II and couldn't even remember that was where this Jumptrooper came from. 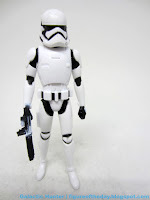 As with many Stormtroopers, it uses the base 2013 trooper figure with some new parts. 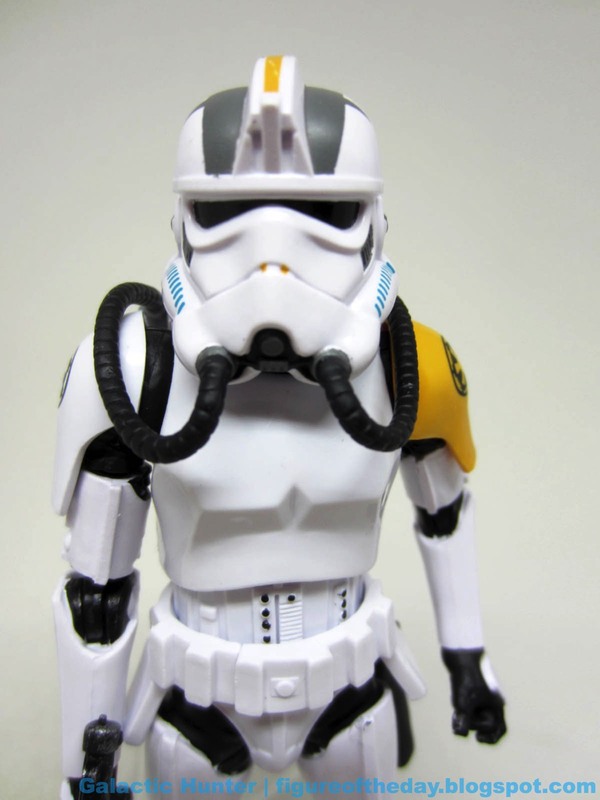 The helmet, backpack, and shoulder pads are new - everything else seems recycled, even if we saw minor tweaks like the torso with a hole in the back used for Sandtroopers. 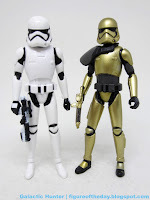 You get the double-jointed elbows, bend-and-swivel wrists, rocker ankles, and the usual gaggle of what makes Hasbro trooper figures pretty great. It's clean - no battle damage here! - and looks like a fusion of the classic design with something modern. It very much looks like what it is - a video game reinterpretation of a classic design. 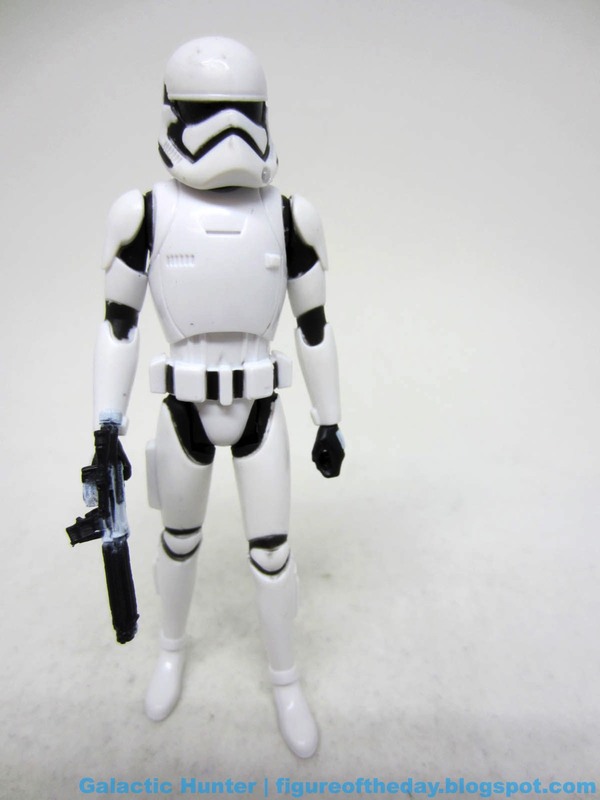 With just shy of 30 points of articulation, this glossy white figure stands quite nicely. Thankfully, Hasbro decided that wasn't enough to make the figure interesting and threw in an all-new display stand. 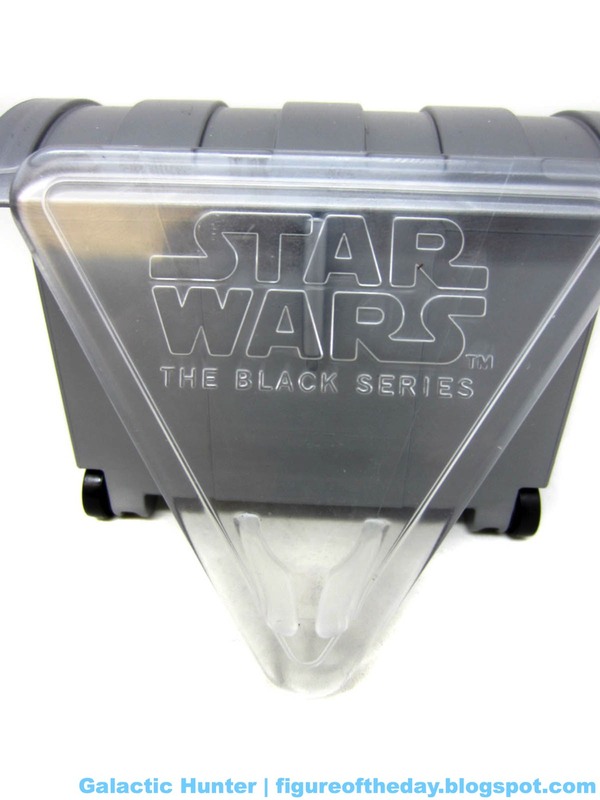 It's a triangle with the series logo on it, and the foot more or less fits in there. it's a little tight. I don't believe it will help the figure stand on one foot over time - mine lasted minutes - but it'll help keep him from toppling on the shelf for a little bit longer. 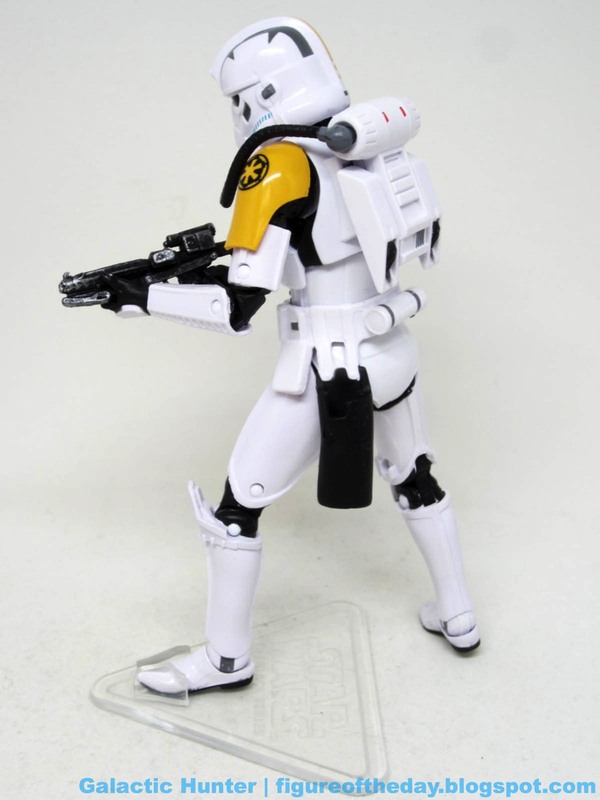 For the asking price, it's not bad - it looks cool and fits in to your shelf of Empire dudes. I'd rather have more movie figures, but I assume this was done because of GameStop staying on message as the game itself no longer seems to be in any real demand. 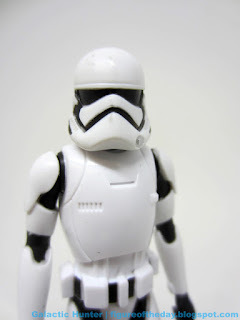 New troopers make the line interesting, and I'd be keen to see what Hasbro designers might do if given free reign to do one or two of their own these days. 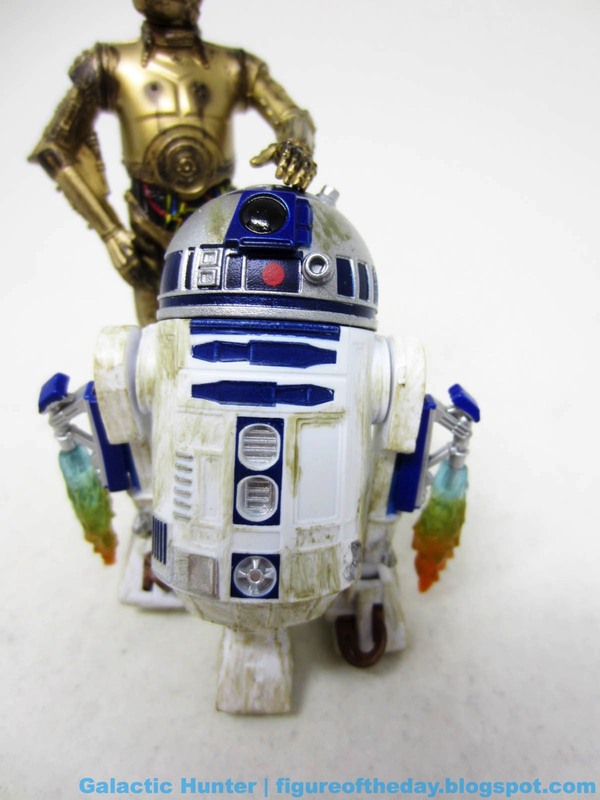 Commentary: 20 years on, you get the feeling Hasbro and Lucasfilm still don't much like the prequels. 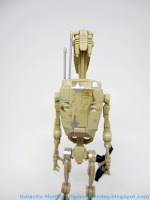 It's a pity, there were some awesome designs in those movies and this Battle Droid was a hit as a small figure in 1999. Today, six years into the 6-inch line, Hasbro adds a third character from The Phantom Menace in the line. I can't assume we'll ever see the entire main cast at this rate, but at least we're getting Obi-Wan Kenobi this year. Oh, and this Battle droid is pretty good. I often roll my eyes at the 6-inch line and vintage line because there's not a lot of room to surprise anyone - the same basic cuts and joints are upgraded with a new joint every few years, or some new paint technique. Lather, rinse, repeat. 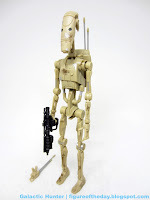 Only though weird droids or unusual body designs do we get anything truly interesting, and given the problems many of these spindly droids had in the smaller scale I was most definitely interested to see what Hasbro would do with these guys. One problem that may come up are limbs warping over time. 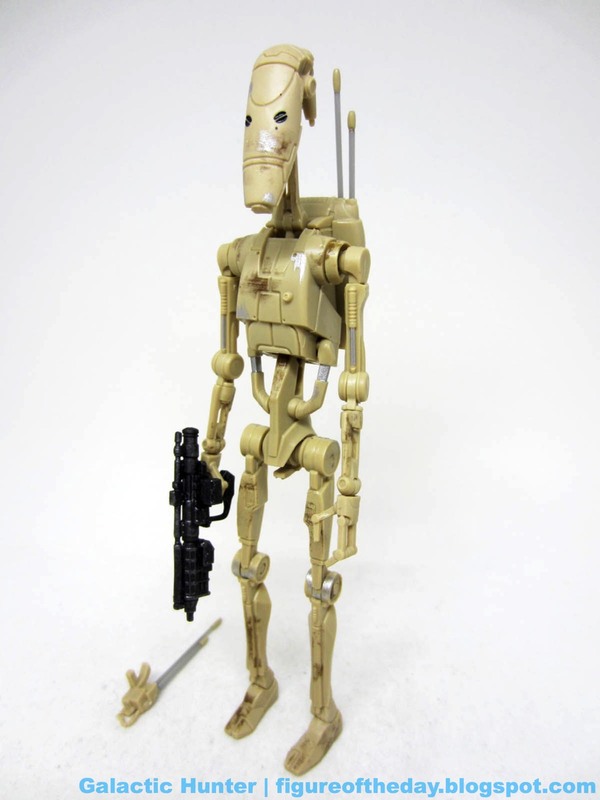 Many of the original smaller Battle Droids could be placed on display stands and would gradually tip over with time - I recommend you use stands with waist clips on this kind of figure to avoid such problems. Hasbro shoved a ton of articulation on this one, with about 24 joints. That's a lot. 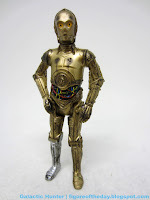 He can stand, but due to the feet and proportions it's difficult to get him to keep standing up without support. You can get him to fold up and crouch down, and he even has the telescoping antenna in his backpack! 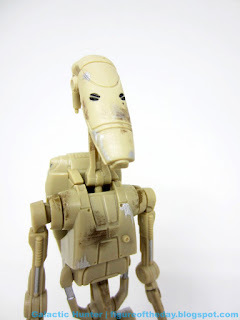 It'll go great for that Battle of Naboo diorama you'll never make because there are no Gungans and you'd never buy enough of them to make it anyway. You'd probably give it some thought, though - the battle damage and paint scuffing is really cool. 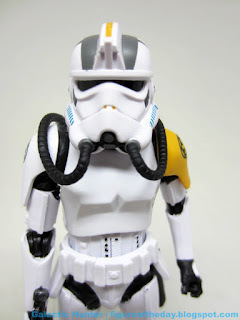 I like what Hasbro did here, and I wouldn't mind seeing a few deco variants of this one eventually. 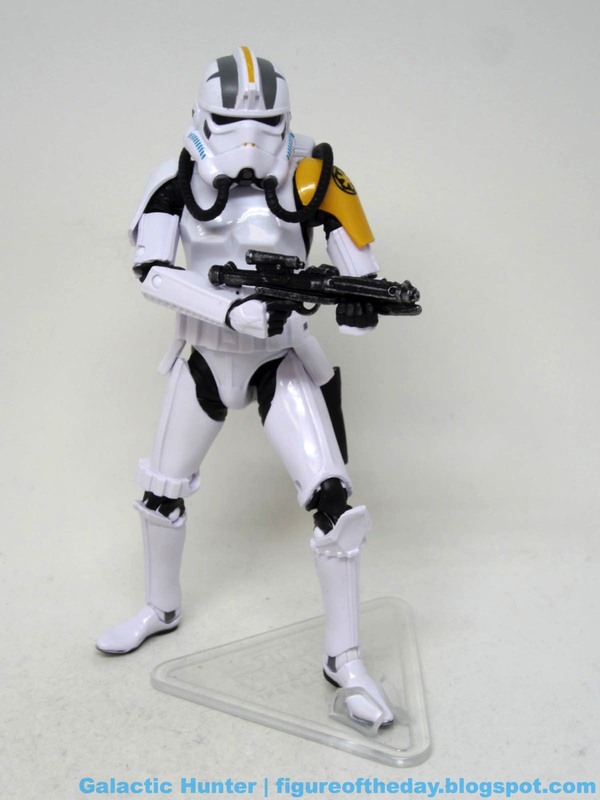 I like this figure, but I think he'll need some long-term support at the waist or under the arms. 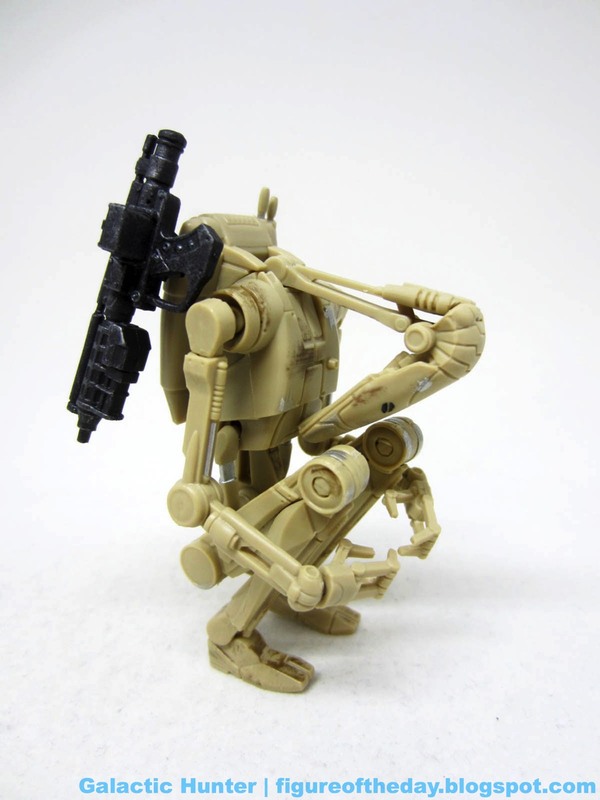 The design is great, I love the added range of motion in the neck and wrists, and it's surprisingly expressive for a relatively dumb bit of cannon fodder. Nice job, Hasbro - and thanks for including parts to let us know you could make OOM-9 if you feel like it. (We are interested.) 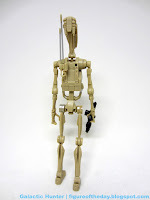 Get yourself the Battle Droid, but I would probably not bother to army build it. 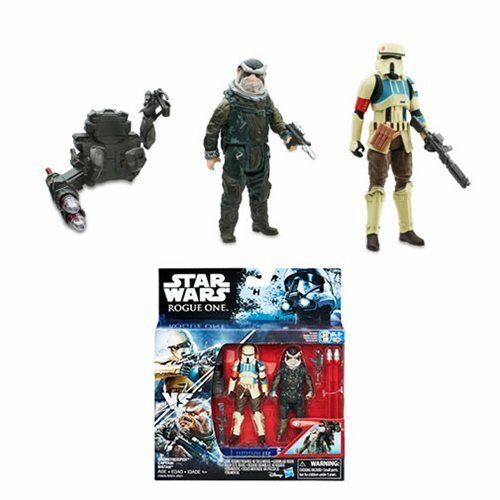 I have to assume we'll get variant deco figures later. 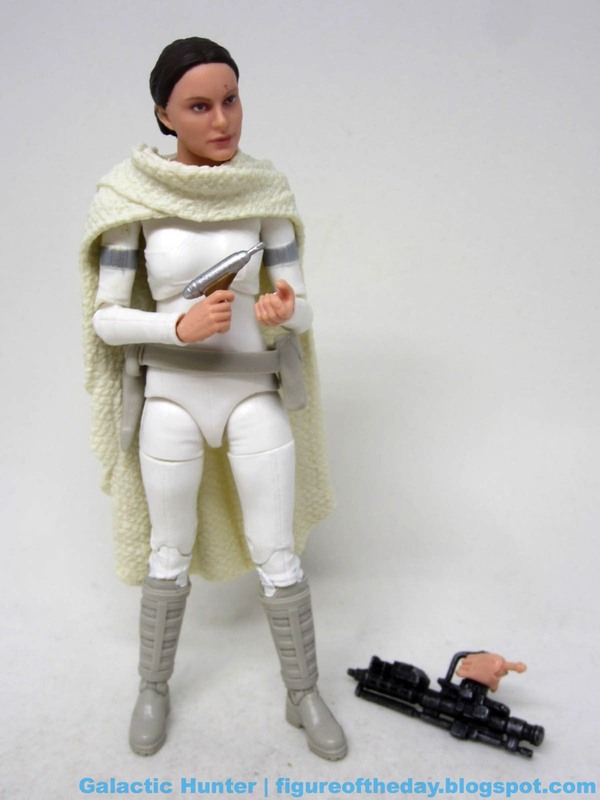 Commentary: Run and do not walk to your favorite online store or actual store to get yourself a 6-inch Padme figure. 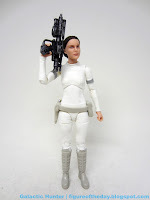 It has been six years since The Black Series 6-inch figures debuted, and this is the very first Padme Amidala in any costume. 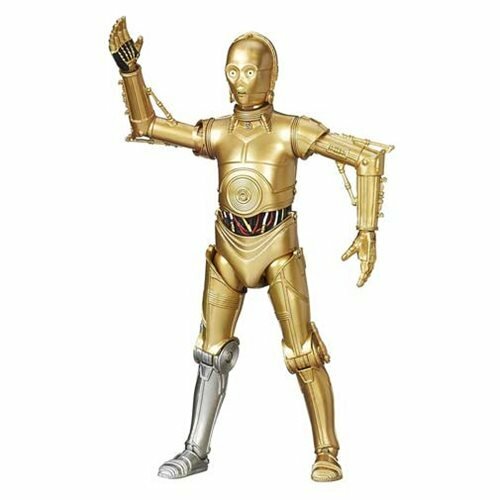 I would say she's worth the wait - the posture seems to match that of Natalie Portman, with exceptional range of movement in the elbows. Oh, and check the face printing. There can still be blemishes. Unfortunately. 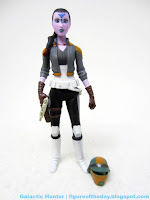 The cape slides over the head - no decapitation necessary - and she has two different right hands depending on which blaster you prefer to use. 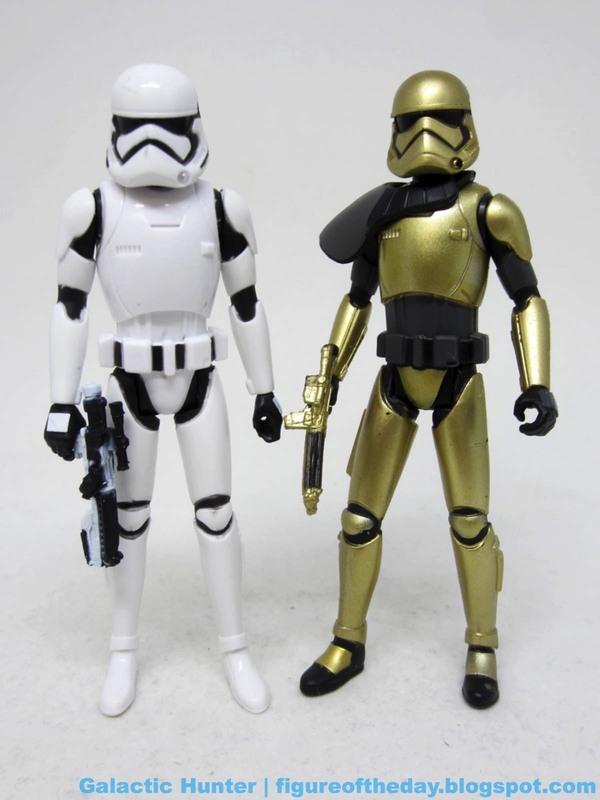 Both weapons have painted highlights and/or scuffing - they didn't cheap out here. The texture on the cape is amazing, and the belt is loose enough to swivel around. My only gripe on this figure is that both right hands are preposterously loose - it might just be my sample, but they just sort of fall with gravity. 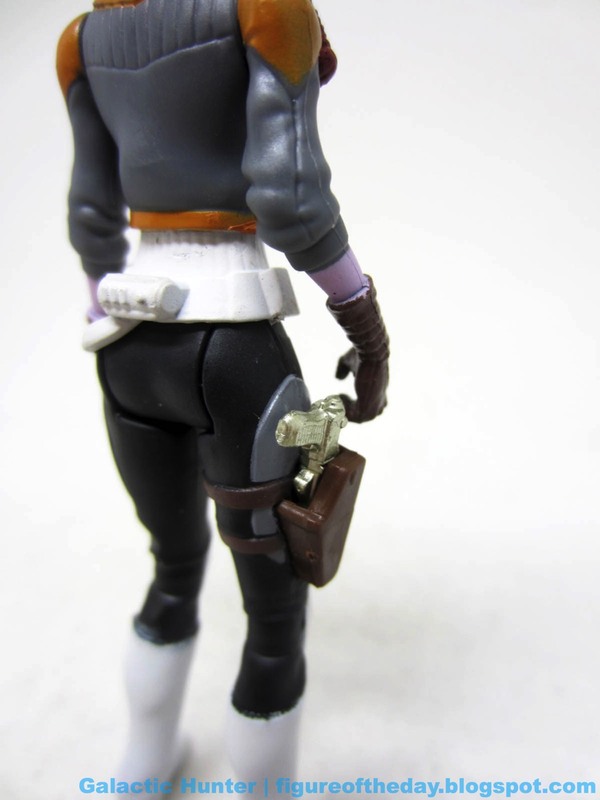 For an exceptional figure with amazing articulation and a sculpt that hides most of her 29 points of articulation I assume we'd always find something off, but the gun hand being loose is a real bummer. 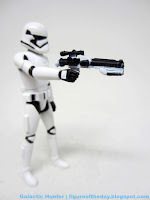 They did such a good job making sure she could hold her blasters! This is a good wave, and I was wondering why Hasbro would double down on her in the case - it turns out it's because she's dang near perfect. I assume a Nexu Damage variant has to be under consideration, but at least we got this one with all the gear first. 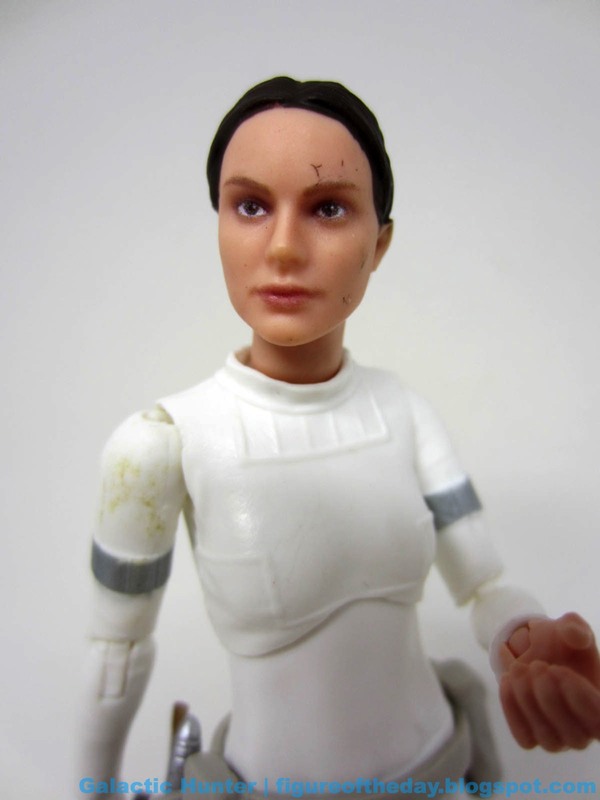 For whatever reason, Hasbro has done a generally good job getting Natalie Portman's face pretty close to the mark and this may be one of the best. 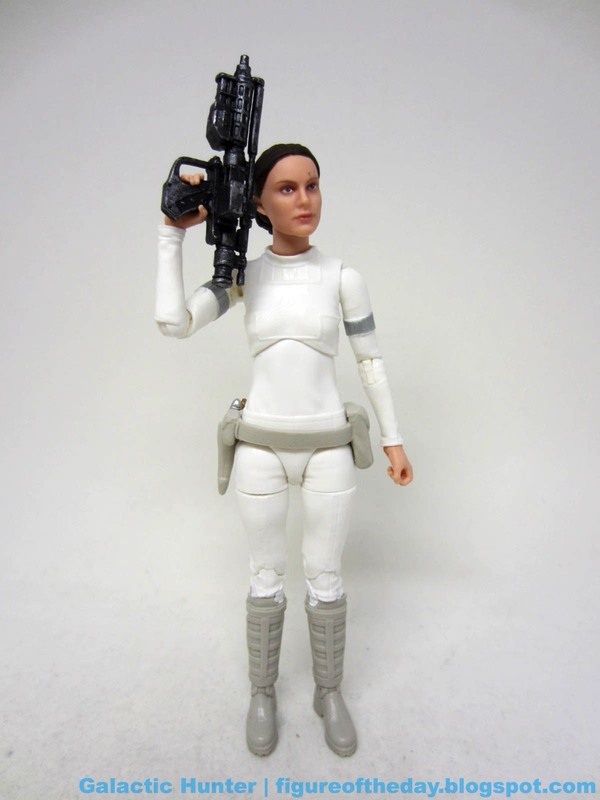 It's a pity there's no matching Anakin or Obi-Wan to go with her yet, but perhaps Hasbro will have something to announce in the near future. After all, they're going to have to put out something in absence of new movies. Commentary: Unsurprisingly, I like the Synara San figure too despite her name being too similar to that of fonts. 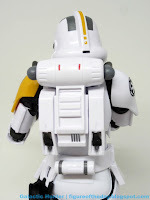 This is a figure that manages to do a good job translating an excellent design to plastic. Her belt, kneepads, and boots look a little bit like the Empire's Biker Scouts. 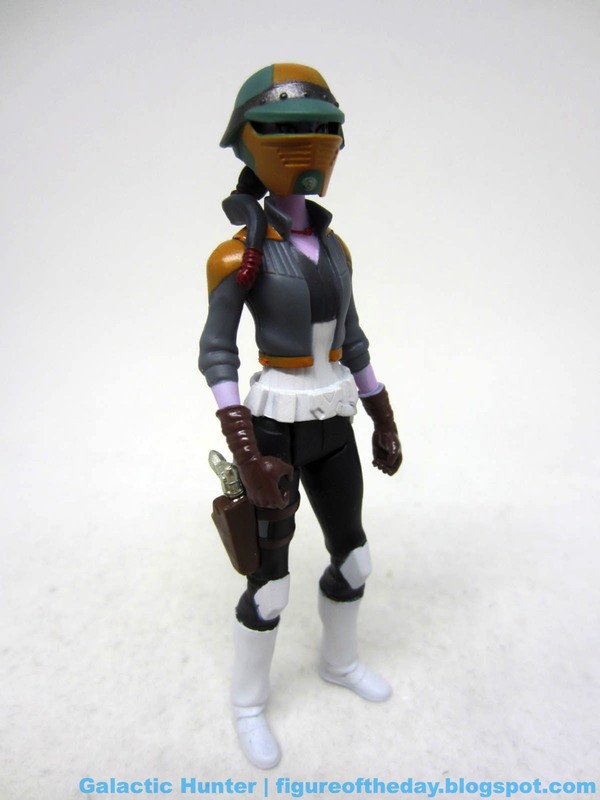 Her helmet looks a smidgen like Lando's from Return of the Jedi. She's of the same alien race as Luminara Unduli and Barriss Offee, plus she has a swell silver blaster that fits in her holster. The face paint is also pretty much perfectly where it needs to be, crisp and colorful. The helmet fits fine, the coat is sculpted close to the body, and she stands just fine. The Biker Scout belt blocks her ability to sit a bit, but it's still a decent range of movement compared to countless other figures. 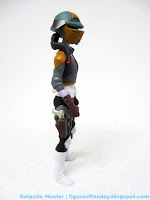 Thanks to her piecemeal costume, cool helmet, and alien uniqueness, she could probably fit in with any Cantina or Jabba's Palace diorama you were looking to populate. There's a ponytail hanging off her head too, giving the design a little more personality. 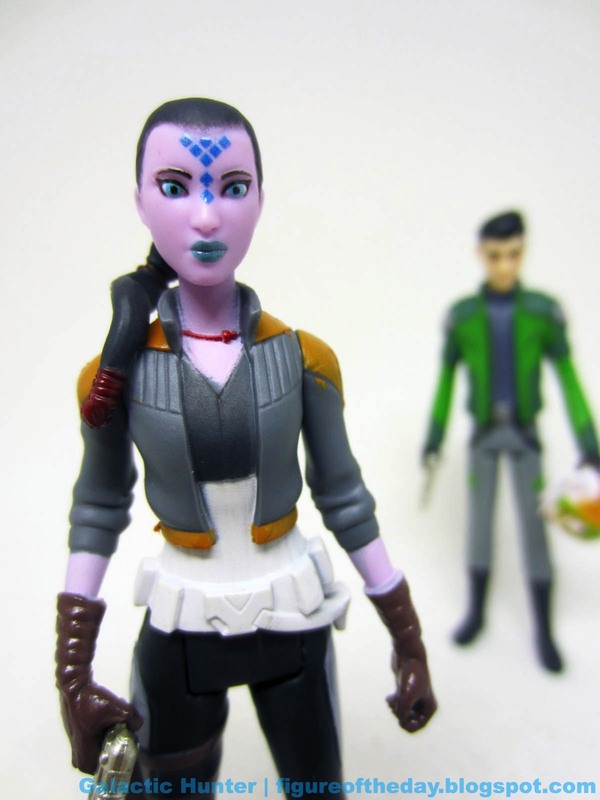 As a semi-regular character, it's wonderful to see her in the plastic. There are some prominent figures we haven't yet seen as toys, and some that are glorified cameos - like Poe - that gobble up some of the wave one slots. This is a worthwhile figure, and I would love to see more of her friends made as figures too. Hasbro - well done. 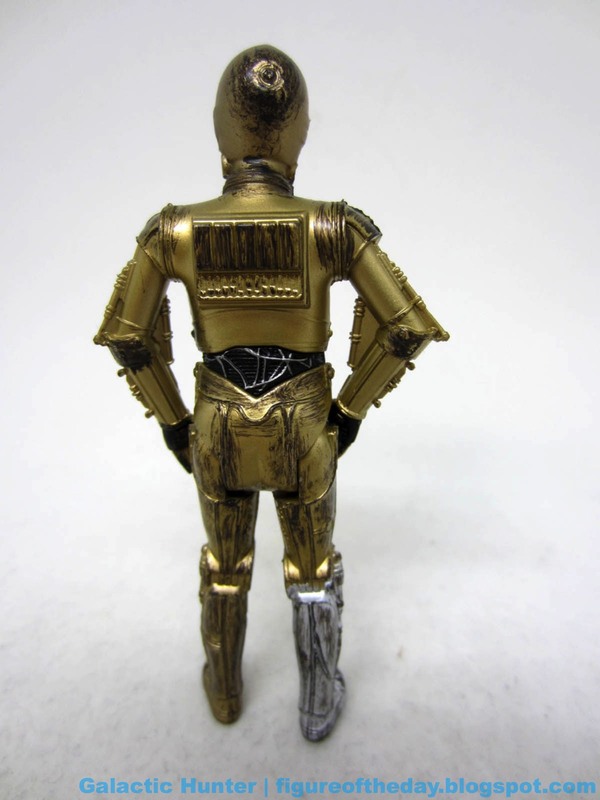 Commentary: This set with C-3PO went through some changes. 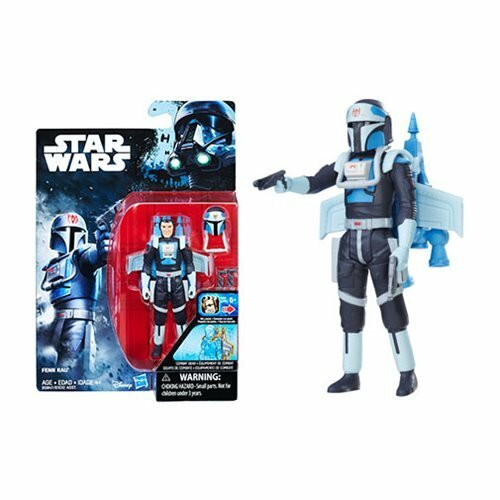 Originally intended as a Toys R Us exclusive 2-pack, it then debuted at Entertainment Earth, and through a series of things I shan't get in to, ended up getting dumped overseas and in closeout channels. You can buy it on certain online stores now - look around, compare prices. C-3PO is a really, really strong redeco of the good 2017 The Last Jedi figure with lots of grease and grime, along with an all-silver right leg. The deco is why you buy this figure. I love the nasty grease, although it would have been cool to have a Jawa restraining bolt on there. 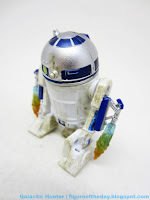 The front and back of the figure has tons of dripping grime, some of which looks natural and some looks kind of faked. At a distance, it all looks excellent. The eyes are yellow and bright with a black dot in the middle, plus he has colorful wires in his belly and silver ones on his back. You get your standard 5 joints - swivel neck, shoulders, and hips - and the Force Link 2.0 chip rattles around in his chest. 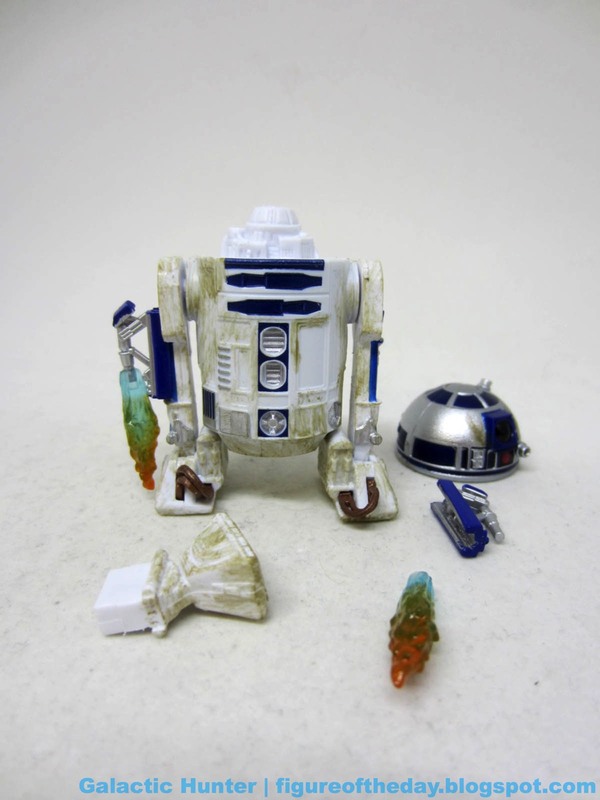 I like this figure a lot - classic fans might want it for their Sandcrawlers or any Tatooine dioramas. Get it if the price moves you, it's a nice set. 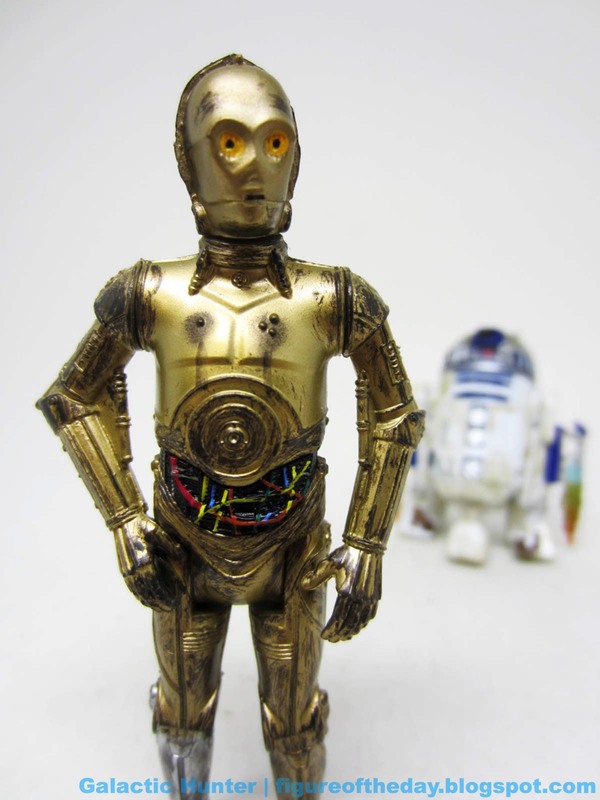 Force Link 2.0 Notes: "I am C-3PO. Human/cyborg relations." "Without the Republic fleet we're doomed." "The chances of survival are 725 to 1." "I've forgotten how much I hate space travel." "It would take a miracle to save us now."